If you enjoy this please share it so others might also enjoy. Does flirting make you unfaithful to your partner? Are you scared of flirting? Do you think it is a precursor to something else? I would say NO, NO and NO again! Is Flirting Harmless? Yes indeed it can be! I’m going to show you how done the right way it is invigorating, fun, exciting and in addition to all that will make you smile. It makes the recipient feel good and makes YOU feel good! Basically it is a plus, plus situation all the way round. Firstly I would say you need to be secure in your relationship! Flirting becomes inappropriate when either the words spoken or the conduct definitely suggests a strong desire to have the relationship become physical. Anything you wouldn’t do in front of your significant other – you shouldn’t be doing when he/she isn’t around. It’s a funny thing how some of the most serious issues are often the easiest to deal with. I think it may be because clients imagine that heavy things like depression are really difficult to overcome and actually that is not necessarily true. Sometimes the biggest things are the easiest to deal with, certainly from a hypnotherapeutic with NLP perspective. I am certainly not downgrading the very real feelings of “being sad” and not being able to get out of bed – I am just saying that you might be surprised at how quickly those emotions can be changed. I love dealing with clients who have depression AND who want to feel better. There are lots of really simple, common sense and obvious techniques and here are a few that I would like to share with you. Try these before you even feel the black cloud descending! Do this on a regular basis! Make sure you get yourself outside into the fresh air – or even not so fresh air! If you live in the city – find a quiet spot, a park bench, and some greenery and BREATHE and LISTEN. And be still. Think of something to be grateful for every day. It could be as simple as having a roof over your head, fresh water from the tap –some people do not even have that luxury or having people around you who care for you. Work out what your favourite music or movie or even book is! Think about it! Why does it make you happy! If you can’t find “the one” that is fine just one that makes you happy and smile is enough. Maybe if you have it close by – watch it, read it again or listen to it. Do it NOW! Any behaviour that you would be uncomfortable with your significant other seeing, shouldn’t be done either. Anything you say that you wouldn’t want your significant other to overhear or hear about – you might want to avoid. The key to meeting people and knowing if they are flirting is to know when someone is flirting, so you can flirt back. Three things to notice: EYES, SMILE, HAIR! Eyes – One way to flirt is with your eyes. You may spot someone across the room and then frequently glance your way, with or without smiling. Smile – Smiling is a way of flirting. Usually, this is a sign that you are open to meeting which is good. Hair – Sometimes, women will also play with their hair, which is done both intentionally and unintentionally. In this case, you might see a woman twirling her hair with her finger, rubbing the back of her neck and then gently flipping her hair, and so on. Let’s talk about Jonathon Ross – he is an all time serious flirter and he means nothing with it apart from having fun. He would flirt with your dog or cat or even hamster. He doesn’t seem to distinguish between gender – he will flirt with everyone! As will David Walliams. And a female flirt? –What about Nigella Lawson? Have you seen her in action? Head down, eyelashes fluttering – bottom wiggling, not to mention the finger licking! We can learn a lot from these public figures. When you think of these characters what do you notice? BIG smiles – from both parties – touching of arms, appropriate touching – the safe area! The extremities! Flirting is a great technique to learn because it is about getting into rapport with people. Communication becomes easier and more fluid with rapport. Without rapport it is very difficult to communicate let alone flirt, conversation will be very difficult and uncomfortable so not a lot of chance to flirt. What is rapport? Rapport is all about body language which could be the physiology of how our bodies are placed, or it could be the tone of our voices or it could be the words we use. All of those aspects make up Body Language and help us build rapport. Let’s talk briefly about matching body language. Very often people have heard of mirroring and that that is all there is to building rapport. Mirroring in case you haven’t heard of it is literally copying every movement the other person makes, every head nod, maybe repeating their words back to them. It is like when children reach that delightful age when they repeat everything you say…. “Everything you say”…. And it quickly becomes really, really irritating “really, really irritating” even using the same inflection sometimes. So my message to you is DON’T mirror if you ant to gain rapport but DO MATCH! Matching is about picking one bit of body language that the other person is doing and copy that. SO if they have their hands behind their back – you could put your hands or just one hand behind you – if they are nodding vigorously then you could nod back (not vigorously necessarily). This needs practice so it is not so obvious! But at the beginning just play with it. When you are with friends, family even colleagues you are probably instantly in rapport – notice how YOU are sitting and then notice how your friends are sitting. If you have your legs crossed, possibly your friend will have their crossed. If you are leaning on the table towards them the likelihood is they too are leaning forward. You might even find you use the same words when you describe things together. So having practiced your matching technique you are set to go! Match! Match! Match again then smile and engage in conversation. Pick your target – let’s be honest it will not work with everyone! 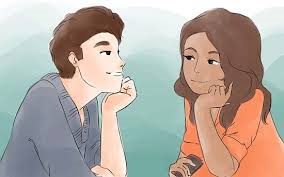 If you want to flirt with someone and they are, or appear to be, distressed or emotional in any way or if their body language is closed, the likelihood is the reaction will not be great! If you have had negative ideas of flirting before I encourage you to look at flirting in a different way now. It is about sharing positive feelings. It is about giving out what you want to get back. So if you want people to smile at you and be happy to see you then you need to smile and be happy to see others first. Remember Flirting is Fun and Frivolous and – nothing more! How often do we try and make things happen to realise that it hasn’t worked or actually it hasn’t worked how we wanted it to work? Can we actually choose? Did you try to get a job only to discover that someone – more qualified or less qualified – older or younger – taller or shorter has got it? You made it to the short list! But…. You didn’t get it. If it truly was meant to be then just imagine a scenario… you would be working at “that place” possibly stuck in the basement, devoid of sunshine, not being able to chat to anyone because no one else worked down in the basement, you don’t have a lovely coffee machine close by, you are pretty miserable with “your lot”. The job was not at all as it was advertised to be. How many of us have had that happen? You go for a job, you are really keen on getting it, and you do everything in your power to get it. You get it. And then you don’t want it? Aren’t we difficult to please? Imagine now, that you didn’t get the job you were supposedly desperate for. You might have another job which is less exciting but you do now the energy to release your creativity and passion into your life. You now have the energy and time to pursue your dream of “World Peace” or Ending Poverty or even just running Personal Development training courses. Just? I hear you ask. “Just?” Well in comparison to World Peace or ridding the world of poverty – yes, running my personal favourite training sessions is pretty inconsequential. But it is MY passion! What is yours? Running a cake company? Boudoir Photography? Painting houses? Back to what happens if you did get that job you were desperate for. You would have been far too involved getting to and from work, when you were at work any energy you might have had would be taken up with trying to imagine golden sunsets and lovely beaches to lighten up your day, stuck in the dark basement. But – and we repeat the mantra “if it’s meant to be it will be” – made famous with a song of the same name: Che Sara, Sara! Whatever will be, will be! Do we believe it? And we can reframe any situation to create a positive slant on the situation. The expression “If it’s meant to be it will be!” does not negate the need to give things a go. It does not give you permission to just sit at home waiting for instance for a Knight in Shining Armour to turn up on your doorstop. I hate to be the one to tell you… but “it just ain’t gonna happenJ” Knights do not know how to ring the front door bell (the armour gets in the way)! But luckily… they like drinking coffee – who knows, in my world that works. 😉 I think you understand where I am coming from. You need to get on and do something yourself about your passions in life, start creating the life you want, the life you deserve, the life which would make you leap out of bed in the morning rather than looking at the alarm clock and wishing it was Saturday or Sunday. So although I do believe that “If it’s meant to be it will be!” I also do not sit at home waiting for things to happen, I GO AND MAKE THEM HAPPEN and if things don’t turn out how you thought you wanted them to be – remember you can reframe the situation. Choose to look for the positive slant in the situation.